The man glared at me, and then his toothless smile broadened. Red beetlenut juice oozed down the side of his mouth. I didn't need a copy of his police records to recognize that a misstep on my part could prove fatal. 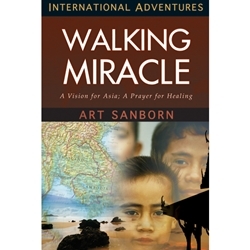 Knowing that the Holy Spirit is actively involved in the lives of believers today, just as he was two thousand years ago, missionaries Art and Ellen Sanborn arrived on the Asian Mission field confident in the power of Jesus - even when surrounded by danger and uncertainty. Years later, after serving in Southeast Asia and beyond, Art would rely on the truth of Jesus' power in a new way when doctors told him that he might never walk again. Though he had broken his neck and partially severed his spinal cord in a freak surfing accident, Art did walk again. His epic journey - from the mission field to the miracle that put him back on his feet - speaks to a life of faith in every circumstance.